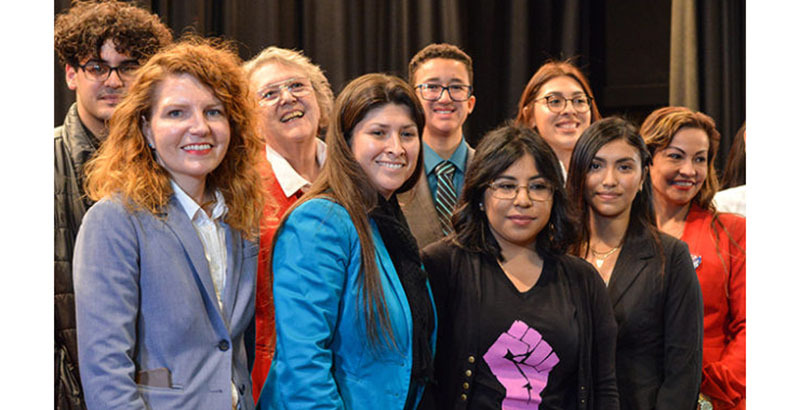 Parents, students, and community members were able to question the candidates running for L.A. Unified school board in District 5 at two separate forums last week, one led by parents and the second by students. High school students wanted their new representative to make sure they are better prepared for college, while parents’ top priorities were teaching quality, school safety, and support for English learners and students receiving special education services. The March 5 special election will fill the seat that has been vacant for seven months, since Ref Rodriguez resigned after pleading guilty to political money laundering charges. On Saturday, about 150 people, many of them high school students, gathered at South Gate High School in southeast Los Angeles to hear how the candidates plan to address college readiness, diversity and inclusion, mental health services, and restorative justice. “We’re not supporting any candidates right now. This is about getting people engaged because there should be a higher voter turnout when it’s about students,” said Noemí Delgado, a member of the student panel. “Voters have to listen to the youth, listen to the children, to the students, because unfortunately students can’t vote. Even though these are issues that are going to affect students, they are not going to be able to have a say in it, so we are really counting on the adults to listen to us and to make a decision that best represents and that best benefits students,” said Delgado, who attends East Los Angeles College and is a member of Latino Equality Alliance. She graduated from L.A. Unified’s Maywood Academy High School. 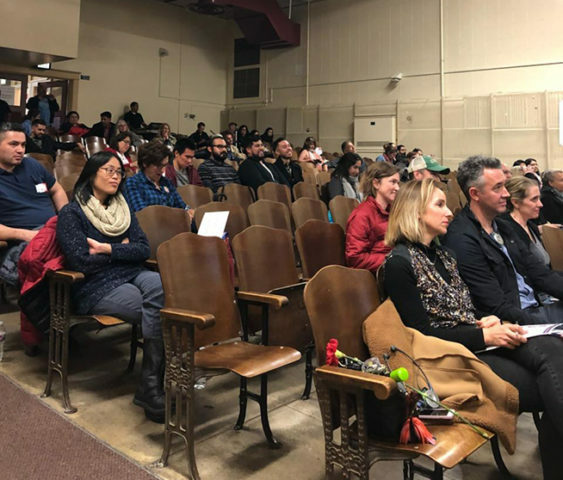 About 100 parents and community members turned out for Wednesday’s forum at Eagle Rock Elementary despite a rainstorm. 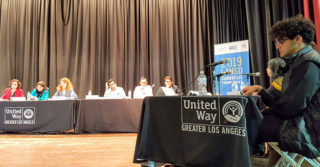 Both forums were hosted by United Way of Greater Los Angeles and Alliance for a Better Community and drew nine candidates each. 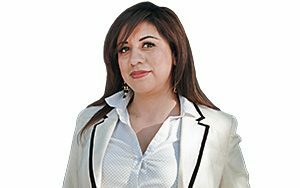 City of Bell Councilman Nestor Enrique Valencia was absent Wednesday, and Rocío Rivas was absent Saturday. The candidates vowed to elevate parent voices at the school board. 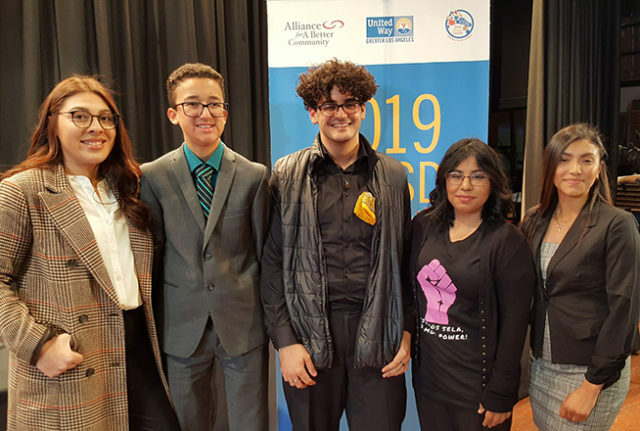 Their ideas included meeting with parents after school hours, creating their own parent committees, and giving all parents, including those who are undocumented, the right to vote like San Francisco Unified has done. On Saturday, a four-student panel asked questions, giving candidates a minute to respond. The students also took questions from the audience for the candidates. Students at the forum came from different parts of the district, and many of them were part of United Way’s Young Civic Leaders program. Board District 5 covers two distinct areas: Two-thirds of its students are in the southeast L.A. section, which is overwhelmingly Latino and low-income and includes cities such as Huntington Park, Maywood, Cudahy, Bell, and South Gate. It also covers the northeast’s more affluent areas of Los Feliz, Silver Lake, Echo Park, and Eagle Rock. The parent panel asked all questions in Spanish, with an English translation on the back screen. Of the nine, four candidates — Ana Cubas, Graciela Ortíz, Cynthia González, and Salvador “Chamba” Sánchez — responded to all the questions in Spanish. David Valdez, Rocío Rivas, and Heather Repenning answered some of the questions in Spanish. Jackie Goldberg and Allison Greenwood Bajracharya responded in English but made some brief remarks in Spanish. Among the nearly 500 constituents from 30 schools across BD5 who responded to the survey and participated in parent focus groups, 84 percent said it is important to have a board member who is Spanish-speaking, but only 48 percent thought that person has to be Latino/a or have a Latino background. The survey’s data also show that 86 percent of respondents ranked teaching quality as their top priority, tied with having safe and welcoming schools. A majority also said that English learners and students who receive special education are the least “adequately supported” students in the district. Rodrigo Guerrero, a panel member and parent of a student at Hooper Elementary in South Central, asked the nine candidates how they will address teacher quality, particularly for high-needs schools. Sánchez, a Los Angeles City College professor and community activist, said there’s no doubt that “poor communities have the worst teachers” and that it is the job of the board member to “act with integrity and make difficult decisions” around this issue. Bajracharya, a BD5 parent and a former Camino Nuevo Charter Academy executive, referred to a new Partnership for Los Angeles Schools report released last week showing that students in the highest-need schools are five times as likely to have “must-place” teachers — tenured teachers who are currently not working because they have not been hired at a specific school site. L.A. Unified schools looking to fill vacancies are required to hire first from what’s known as the “must-place” list. These are teachers who have lost or stepped away from their positions at one school but have not been hired at another. In June, the board unanimously passed a resolution that exempts the principals of the lowest-performing schools from having to hire off the must-place list. At Tuesday’s school board meeting, a resolution was defeated that would have extended this hiring freedom to all schools. “We need to raise teachers’ salary to attract more qualified people, and then the personnel division needs to send the most qualified, the best new people to the places where we need them the most, where they can build a career,” Goldberg said. Valdez, a Los Angeles County arts commissioner, agreed that teachers should be paid more. “We do need to continue to increase teachers’ salaries, because it needs to match the cost of living in Los Angeles.” He also called on L.A. Unified to accelerate the pathway for new teachers to enter the profession by eliminating the current “bureaucratic” process. González, a district high school principal who has been endorsed by the Los Angeles Times, said she would establish a teacher residency program so that new teachers will be better prepared to serve students at high-needs schools. Cubas, an East Los Angeles College professor, agreed with Repenning that incentives for teachers can be a solution to what she called a “fundamental systemic issue” and said she would create “an equity incentive” and hold principals accountable. Rivas called for “elevating the respect for the profession” and recruiting more teachers of color. Magda Vargas, the mother of a student at Ellen Ochoa Learning Center in Cudahy, in the district’s southeast, asked the candidates Wednesday how they would reduce class sizes beyond what was negotiated in the new teachers contract, which lowers the size of classes by one student over each of the next three years. “That is not very much — what do you propose?” Vargas asked. Valdez said he is in support of a moratorium on charter schools’ growth in L.A. Unified, which the school board last month voted to ask the state to impose, because he thinks that is a main reason district schools get less funding to hire more teachers, which would reduce class sizes. “It’s not to say that any of the schools that we currently have need to go away immediately, but we need to look at stopping the addition of additional campuses here at school grounds,” he said. The district also needs to add more teaching assistants, he said. Repenning also said looking at teaching assistants would be a “less expensive” way to help in reducing class sizes. In LA Unified, 42 percent of students met reading standards last year. Emily Carlin, a parent at Eagle Rock Elementary, said she attended Wednesday’s forum because she wanted to see which of the candidates had “a more dynamic presence, because I think that’s the kind of person we need to represent us at the board at this time because of how contentious things are right now.” One of her main concerns was class size. A question coming from the parent audience on Wednesday was how the candidates would improve the lowest-performing schools — those in the bottom 5 percent of schools, as released by the state earlier this month. L.A. Unified has 110 schools that require assistance; 56 of those are in the bottom 5 percent of schools in the district. Another question from the audience was how each of the candidates will address the high cost of teacher pensions for the district, which is expected to drain its reserves by 2021. The district spends $1.1 billion a year — about 15 percent of its budget — on health and welfare benefits. These benefits, along with pensions, are expected to consume half of L.A. Unified’s budget by 2031-32. Bajracharya was the only candidate who acknowledged that. González said she agreed with Goldberg on the issue. She said that the benefits package offered by L.A. Unified is one of the main reasons some teachers leave charters or private schools to work for the district. Delgado asked the nine candidates on Saturday their plan to make sure high-need students have the right resources available to be eligible for college. Raven Lawson, a senior at Los Angeles Center for Enriched Studies who attended Saturday’s forum, said even though she is not a student in BD5, she cares about this election because “I’m an LAUSD student, and ultimately they all [board members] are making decisions for our education. I want to make sure all of us [students] have the resources to be college-eligible,” she said. Lawson thinks her college application process “could have been much easier” if her counselor had started the process earlier and students would get more information before applying. Bajracharya said she will look at the high school graduation requirements in L.A. Unified and “change them from a ‘D’ to a ‘C’ so all of our students can graduate eligible to apply to UC and CSU” — University of California and Cal State University schools. Students also questioned the candidates about how they would provide more mental health support to students and for restorative justice practices. Michael Vuenagua, a high school senior at the Robert F. Kennedy Community Schools, said he wanted to hear how the candidates plan to address issues like mental health. He said that as a senior he experienced a lot of stress about this year’s responsibilities, and because he is going through tough personal issues, he felt he needed more support at school. He is 18 years old and is planning to vote in the election. Valdez said he thinks that “restorative justice centers should be in all of the campuses, particularly at high school campuses.” He also said that “LCFF dollars [state funding] should go for more mental health counselors” at school campuses. Some of the candidates took advantage of that question to speak about racism and addressing social issues faced by minority students. Ortíz said she believes that what the school district needs is a “concise discipline policy” because of the behavioral problems among students — “a lot of them have to do with social issues that have never been addressed.” She also said that parents need to receive more support to help their students deal with discipline issues. Cubas told the audience her goal is to “restore social justice and equity to our schools” as she called the district a “hypocritical” school system. “On the one hand, they need their daily average attendance, but on the other hand they’re criminalizing our students and kicking them out of the schools,” she said. On Wednesday, the nine candidates vowed to give parents “real empowerment” and a “voice” at the school board. “My real focus is to help parents advocate for their children,” Sánchez said. “Our parents have been abandoned. I want to give a real empowerment to the parents [and] use the power of this office to allow [undocumented] parents to vote like San Francisco [School District] is doing,” he added. “Parent centers are the heart of every school. I will support parent centers, making sure parents have a voice. And also adapting our hours so they can have more participation,” Ortíz said. Cubas said she would create a parent council to meet with her regularly, and she would empower parents by creating a “parent university where they can learn English” and take citizenship classes. “We need to empower them with knowledge,” Rivas said. Michelle Gunn, the mother of a student at Eagle Rock Elementary, said she wished the candidates had more time to respond to the questions and go more into detail about their solutions. But she said it was helpful and that for her, it’s very important to participate in this election.